Below is information about our brochures, our online resources (including meeting and event listings) and suggested websites. 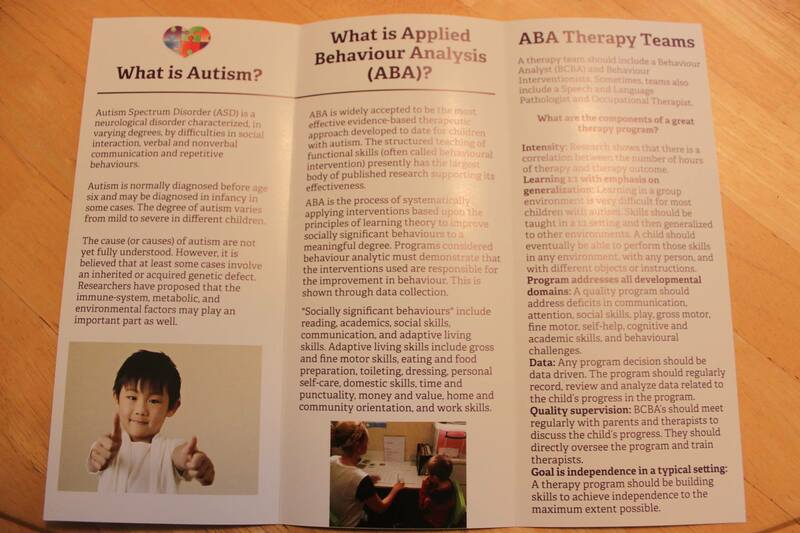 Our Brochures – our brochures contain excellent information about Autism, Applied Behaviour Analysis (ABA) and ABA Therapy Teams. If you would like some brochures to distribute in your area or take to a medical professionals’ office please CONTACT US and we will mail them to you. The Autism Support Network manages the following online resources. Please check back regularly as often we schedule events and meetings based on community demand. You can also JOIN OUR MAILING LIST for monthly updates. Autism Support Network Online Calendar – a listing of meetings and events presented by the Autism Support Network as well as information on other events that we attend with our information booth. Autism Support Network Facebook Event Listings – A listing of Facebook events created for Autism Support Network presentations and meetings. Connected to the Autism Support Network Facebook Page, please like, follow and share! Autism Support Network of British Columbia – Parent Group (Facebook) – This ASN Parent Group is a forum for ABA parents to talk, ask questions and share stories and concerns. We have kept this a closed group so that parents feel comfortable about posting and sharing personal stories about their families. ABA Therapists BC (Facebook) – This group is for BI’s to post idea’s on Reinforcers, great stores they go to and Apps they use. It is also a job resource board to connect families and therapists (AKA tutors, AKA Behaviour Interventionists (BI’s). The Association for Science in Autism Treatment (ASAT) is a not-for-profit organization run by an all-volunteer board of 22 professionals, many of whom are parents of children and adolescents with autism. ASAT is committed to improving the education, treatment, and care of people with autism. Since autism was first identified, there has been a long history of failed treatments and fads levied on vulnerable families. ASAT was the first autism advocacy group to explicitly embrace an empirical, science-based approach to any statements made about the causes and proposed treatments for autism. The Autism Center of Excellence at Western Michigan University has developed a series of video interviews with national experts in applied behavior analysis, autism and behavioral pediatrics. These videos are available free of charge. These videos feature presentations and interviews with experts in applied behavior analysis and behavioral pediatrics. In many cases, the videos also include supplemental materials and clinical simulations that demonstrate the application of essential features of an assessment or intervention technique. These videos are designed to enhance the ability of applied behavior analysis practitioners (e.g., BCBAs, BCaBAs and RBTs) and applied behavior analysis students in training to understand and to implement important behavior analysis assessment and treatment techniques with children, especially those with developmental disabilities such as autism. Topics include Assessment and Treatment of Behavioral Sleep Problems, Assessment and Treatment of Self Injurious Behavior, Preparing Children for Medical, Dental and Personal Care Appointments, Functional Analysis of Problem Behavior and many more. Additional videos are in production and will be published as they are completed. ACT manages the Registered Autism Service Providers list. The Registry of Autism Service Providers (RASP) is a listing of professionals whom parents contract with to provide services to their children with autism. The RASP includes Behavior Consultants, Speech-Language Pathologists, Occupational Therapists and Physical Therapists. Parents with children with ASD, under six, must choose their professionals from the RASP if they wish them to be paid by the Ministry of Children and Families. Just because a service provider is on the RASP list does not mean that they are a good choice for your family. Please evaluate service providers very carefully and understand their treatment and billing practices before signing any contracts or agreements. We highly recommend this site and think that it will become every parents’ “bible” of autism funding and treatment administration. The author of this site is a parent, and will tell you in a simple way about the financial side of providing ABA treatment for your child and how to run an effective ABA therapy team in BC. The Autism Society of British Columbia (ASBC) was started in 1975 and is a parent based and directed society providing support to individuals with autism and their families in British Columbia and Yukon. There are an estimated 1100 family members as well as corporate, professional and associate memberships. The Mission of the Autism Society of BC is to promote understanding, acceptance, and full community inclusion for people with autism in British Columbia while providing support for the realization of the rights and informed choices of individuals with autism and their families. Together with Autism Speaks, the founding organization in the United States, Autism Speaks Canada has grown into North America’s largest autism science, awareness and advocacy organization, dedicated to funding research into the causes, prevention, and treatments for autism; increasing awareness of autism spectrum disorders; and advocating for the needs of individuals with autism and their families. The BC-ABA is a society that was formed to function in British Columbia, Canada, as the liaison with, and representative of the Association for Behavior Analysis, ABA International. Their goals are to advance behavior analysis in the province of BC and to work towards the regulation on behavior analysis practitioners in BC. The BC-ABA publishes a newsletter which is accessible on their site. The Canucks Autism Network (CAN) provides year-round, innovative, high quality sports, recreational, arts, and social programs for individuals and families living with autism, while building awareness and capacity through community networks across British Columbia. The Canucks Autism Network team consists of a diverse group of trained staff, support workers and dedicated volunteers who administer programs for families and individuals living with autism in our province. Capilano University offers both a Bachelor’s degree and Post-Bac Diploma in Applied Behaviour Analysis – Autism. Successful graduates are eligible to sit for the examination to become Board Certified Assistant Behaviour Analysts (BCaBA). This is an excellent program for experienced Behaviour Interventionists who seek to advance in the field as practicing BCaBAs or as a stepping-stone to graduate school. To get laws passed that gives Canada’s Charter of Rights and Freedoms real force in the daily lives of British Columbian voters with disabilities. Please read the Civil Rights Proposal, and download it to send to your local candidates/MLA. Ask them to review it and respond in writing if they would support the legislation. The District ABA Advisory is for parents of children with autism that are involved in Applied Behaviour Analysis (ABA) under the direction of a Behaviour Consultant. The purpose of the Advisory is to hear input from Parent’s on key issues that impact the effectiveness of ABA services in schools in SD#36. F.E.A.T of B.C. is a non-profit, volunteer organization of parents and concerned professionals working for universal access to effective autism treatment for all children diagnosed with autism and other pervasive developmental disorders. F.E.A.T. of B.C. accepts no money from the government. All financial contributions to F.E.A.T. of B.C. go toward the work of making effective autism treatment available to everyone regardless of ability to pay. The chat board on the F.E.A.T. of B.C. website is an invaluable tool used by parents and professionals across the province. The Family Support Institute is a province-wide organization whose purpose is to strengthen and support families faced with the extraordinary circumstances that come with having a family member who has a disability. We believe that families are the best resource available to support one another. Directed by families, the Family Support Institute provides information, training and province-wide networking to assist families and their communities to build upon and share their strengths. This insightful blog is maintained by parent and advocate Harold Doherty. Harold describes life with his severely autistic and epileptic son, Connor, as well as writing about the serious issues and challenges faced by the autism community in Canada. Harold is one of Canada’s most highly respected autism advocates, and most recently joined the Board of Directors of Medicare for Autism Now! Growing Together is a provincial effort dedicated to the needs of brothers and sisters of persons who have unique health, developmental, and/or mental health concerns. As part of the initiative to create the Pacific Autism Family Center (PAFC), Growing Together will develop programs dedicated to support siblings of persons with developmental disabilities and/or mental health issues across the province. The techniques that are utilized in ABA are constantly being tested, altered, and improved to find the most effective and efficient way of modifying behaviour. The Journal of Applied Behaviour Analysis (JABA) website is a way for parents to look to research about common problems (ie/feeding, choice, reinforcement schedules, waiting). The Lovaas Institute is commited to providing the highest quality treatment available to children diagnosed with autism or a related disorder. They approach this one child at a time by individualizing each child’s program to best meet his or her needs. The Lovaas Institute has treatment centers and replication sites across the USA. The Wisconsin Early Autism Project (replication site) offers consultation services out of an office in Delta, BC. See www.wiautism.com for details. Check out the newsletter “Meeting Point” on the Lovaas.com site which contains practical tips and information for families. The “Medicare for Autism Now!” Society was incorporated in August, 2008. We are a national coalition of non-partisan, parents, advocates, professionals and growing numbers of other fair-minded Canadians seeking Medicare coverage for effective, science-based autism treatment otherwise known as ABA (Applied Behaviour analysis). Over 40 years of research and litigation have identified this treatment as medically necessary. It is the only core health need not included in health care, therefore costing thousands of Canadian families up to $80 thousand dollars a year each to access the only uniquely effective treatment for their children. The Ministry’s Mission is to provide programs and services to ensure that healthy children and responsible families are living in safe, caring and inclusive communities. The Ministry’s page on autism is here. The National Autism Center is one of May Institute’s centers for service, training, and research. It is a nonprofit organization dedicated to serving children and adolescents with Autism Spectrum Disorders (ASD) by providing reliable information, promoting best practices, and offering comprehensive resources for families, practitioners, and communities. The National Autism Center has completed an unprecedented multi-year project — the National Standards Project — to establish a set of standards for effective, research-validated educational and behavioral interventions for children on the spectrum. These standards identify treatments that effectively target the core symptoms of ASD. The resulting National Standards Report is the most comprehensive analysis available to date about treatments for children and adolescents with ASD. It is a single, authoritative source of guidance for parents, caregivers, educators, and service providers as they make informed treatment decisions. The Pacific Autism Family Centre (PAFC) is a proposed centre of excellence for individuals with Autism Spectrum Disorder and their families. The PAFC’score purpose is to be a Knowledge Centre: Bringing together state of the art resources for research, information, learning, assesment, treatment and support; and building capacity to address the lifespan needs of individuals with ASD, and their families across BC. The goal is to ensure that the Centre builds upon existing lifespan services while at the same time addressing the need for support and services across the province. This blog is maintained by parent and advocate Dr. Sherri Brown. Dedicated to Building Empowerment, Awareness, Resources, Information and NaviGation Services in the autism community in BC and across Canada. Based on much research into Autism treatment and thousands of hours of volunteer consulting work with new parents helping them access treatment, SKF has developed products that act as a roadmap to help parents improve Autism treatment for their children. SKF Books also recognizes the importance of Autism advocacy. An example of this is the important need to help parents who are involved in litigation fight for their child’s rights to science-based treatment.